This is Part 5 in a series of photo galleries showing pictures of Oriental dance performances I saw while I was in Turkey in July, 2000. This gallery features several dancers who appeared as just the sole performers in shows at various places. The big nightclubs that catered to the tourist crowd tended to feature 3 Oriental dance acts in a single night, but some of the other places had just one performer. See the Related Articles section at the end of this article for links to the other photo galleries of dance highlights from my trip to Turkey. One of the things I enjoyed about watching dancers in Turkey is that many of them use finger cymbals. If you look carefully at the pictures in this article, you'll see several of the dancers using them. In contrast, Egyptian dancers often don't — instead, they hire someone to play cymbals for them in the band. Parts 1, 2, and 3 focused on dancers that our group saw on three consecutive evenings in Istanbul at high-quality nightclubs. Part 4 focused on dancers that our group saw in the town of Kusadasi. Each of those clubs served a complete meal as well as presenting a show that included both traditional Turkish folk dances and Oriental dancers. After spending several days in Istanbul, we then went on a bus tour in central and eastern Turkey. Shows like the ones we saw in Istanbul are not as easy to find out in the countryside, but we still enjoyed some good entertainment along the way. One interesting thing I noticed was that the use of cutouts in costuming that was so common in Istanbul seemed to be unknown out in the countryside. None of the dancers we saw in the countryside seemed to have costumes in that style. Our first stop after leaving Istanbul was the Cappadocia region in central Turkey. We went to an evening show July 14, 2000 at a club called Yasar Baba. Like the Istanbul clubs, Yasar Baba also had a folk dance troupe performing. But at Yasar Baba, it was apparent that the folk dancers were the prestigious act, whereas the Oriental dancer appeared to have been thrown into the show simply because tourists expected to see one. The folk dancers wore a variety of eye-catching costumes over the course of the evening and did several sets. Their performance was very elaborate, complete with a horse brought indoors into the club with a woman playing the role of bride riding on it. They led the audience outdoors to where a bonfire had been set, and danced around the bonfire in an enactment of a wedding celebration while the audience gathered. In contrast, I found the Oriental dancer at Yasar Baba to be disappointing. As these photos show, her costume was very, very plain, and her posture was not that of a proud, glamorous dancer. Although the costume fabric contained a bit of sparkle, the cut of the garment was not done with a designer's eye, and there was no ornamentation at all. She entered holding her veil already draped across one arm as shown in this photo, and never took it off the arm to do anything interesting with. I'm assuming her intent was to emulate the Egyptian practice of entering while holding a piece of fabric. However, she missed the point. The Egyptian practice originated to encourage the dancer to carry her arms proudly. Other dancers in Turkey whom I saw entering with a veil understood that when you bring a prop on stage you should use it meaningfully — they held their veils in positions where they would flow or swirl as they moved around the stage and spun. In contrast, this dancer simply left her veil drooping limply over one arm the entire time she danced. This dancer was probably my least favorite of the dancers I saw over the course of the two weeks I was in Turkey because her posture was poor, her personality came across as being utterly bored with what she was doing, her costume was not very interesting to look at, and she annoyed me with her constant attempts to provoke the audience to clap in time to her music. One interesting thing about this dancer's performance was that she placed a small, attractive Oriental rug on the floor and sat on it. Then she placed several Turkish coins about the size of quarters (maybe slightly larger) on her abdomen and rolled them, reminiscent of the coin-rolling that Helene Vlahos did on an episode of the television show That's Incredible around 1979 or 1980. This dancer succeeded in rolling all 3 or 4 coins over once from her upper abdomen to her lower. Then she attempted to flip them back to their starting position, but wasn't able to do it. Eventually, she gave up on that, picked up the coins in her fingers, placed them back in their original positions, and rolled them a second time. Again she tried to flip them to the starting position, and again it didn't work for her. The thing I found most annoying about the Oriental dancer at Yasar Baba was her continuous attempts to get the audience to clap along with the music. I always find it a little annoying anyway when a dancer does that — as an audience member, I prefer to decide for myself when I will or will not clap. And I usually would rather nod my head in time to the music or smile at the dancer rather than clap along. That's just me. I realize that some dancers try to get the audience clapping along with the music as a way of making the audience feel more involved and raising the energy level of the room. I don't care for it, but I can tolerate it in small doses — at most 2 or 3 times over the course of an entire performance. Beyond that, it feels excessive. That was the problem with this dancer — the "please clap" gestures were obnoxiously frequent. At times, they came as often as once every 15-20 seconds! I started to think her clappy little hands made her look like a trained seal. I wanted to snarl to her, "If you want me to clap for you, then do something worth applauding!" A couple of nights later, after moving on to another city, we arrived at our hotel to discover that their bar featured an Oriental dance performer. Of course, we needed to watch! 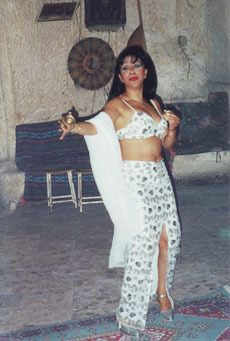 After the disappointing costume worn by the dancer in Cappadocia, it was refreshing to see the dancer on July 17, 2000 at the Colossea Hotel near Pamukkale wearing this pretty beaded bra/belt set with a circle skirt. She did the usual "get the audience up on stage to dance" act, and was delighted to discover that our group consisted of 25 dancers! The 15th and final dancer that I saw during my two weeks in Turkey appeared on July 20, 2000 at a restaurant that we went to after returning to Istanbul. I was disappointed with her dancing, but her costume was pretty. Not innovative, but pretty. A "classic" style. She played finger cymbals, which I appreciated. I especially liked the beads draped across the shoulders like epaulets. This dancer wasn't a very interesting dancer to watch. Her attitude led me to believe that she was completely bored with what she was doing, and couldn't wait to finish her gig and get out of there. Out of the 15 different Oriental dance acts I saw in Turkey, this was the only dancer who went out into the audience for tips. Nobody else did, at all. The way she went about it was actually rather obnoxious. She unceremoniously made her way to a table and went right up to a man, and shimmied her hip right in his face until either he tipped her or she figured out that he wasn't going to. She didn't pay any attention to the women at all, which meant that she ignored 20 of the 22 people in our party. After receiving a tip, she didn't bother to thank the giver — she just turned her back and went looking for her next victim. Now, I don't mind when a dancer goes around and visits the tables in hopes of receiving tips. I sometimes do it myself when I dance. But behavior is everything, and this dancer was an example of how not to do it. Ignoring large numbers of audience members, acting annoyed when tips are not forthcoming, and failing to thank the giver are all bad behavior. You'll notice that this unpleasant behavior is the primary thing I remember about her show.